Whether BBQing on the deck or indoor-grilling, add that "perfect touch" to your culinary creations in about 30 seconds. 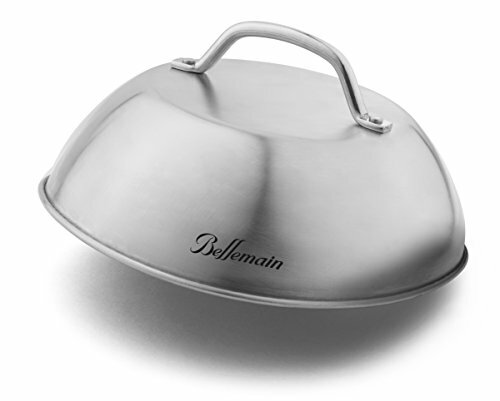 The Bellemain Stainless Steel Melting Dome is designed to be your assistant in crafting tasty cheese-dripped burgers, succulent veggies, and more. Because cooking is an art form, but that doesn't mean you can leave it to chance. Fire things up QUICK with the Bellemain Stainless Steel Melting Dome. The perfect depth and size captures just the right heat to melt your cheese in 30 seconds while leaving your burger tender and delicious. Use on the back-deck BBQ for perfect burgers, then bring it inside to steam your veggies and put the finishing touches on your rice. The dome body is precisely made to the perfect depth for steaming, and its stainless steel inside prevents rust or staining. As Fast As You Are-and Safe, Too! When things heat up in the kitchen, choose the melting dome made to move with you, not against you. With its quick-grab handle this pro tool can beautify burger after burger-and its rolled edges keep it stable on any surface. • MAKE THE JUICIEST BURGERS ON THE BLOCK: Use fearlessly on your outdoor BBQ and kitchen stovetop to get that "professional meat" look, and taste! Sized for convenience and made with powerful stainless steel to prevent rusting. • THE PERFECT SOLUTION TO KEEPING FOOD WARM: Don't fumble with upturned bowls or unstable domes when perfecting your meals. This steel melting dome is designed with smooth rolled edges for stability to keep food warm, safely and easier than other domes. • QUICKER COOKING, EASIER CLEAN-UP: These melting domes bring your burgers, eggs, and frozen pizzas to the perfect heat faster by capturing and redistributing heat that would otherwise go wasted. And these melting domes are made with an odor-and stain free stainless steel body that won't rust in the dishwasher. • 2-YEAR "ALL CLEAR" WARRANTY: When you make a meal, you want those who eat it to be blown away. We're the same way with our products! That's why we protect you with a full, no-questions-asked 2-year warranty.